“In my opinion, having the opportunity to practice the guru yoga of the great holy being Lama Tsongkhapa, is more fortunate than having the chance to receive and practice other Dharma teachings,” wrote Lama Zopa Rinpoche, in the book Guru Yoga. 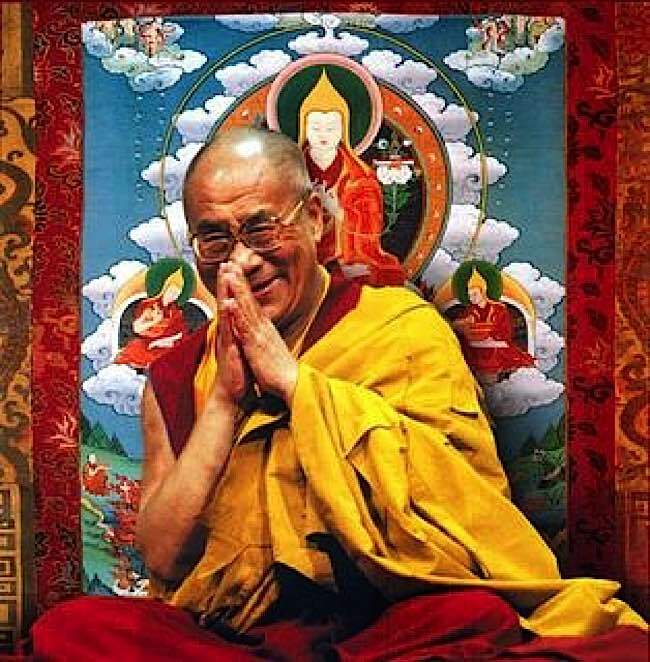 Many famous gurus, lamas and teachers — including the Dalai Lama, (two videos from His Holiness below), Lama Zopa Rinpoche, H.E. 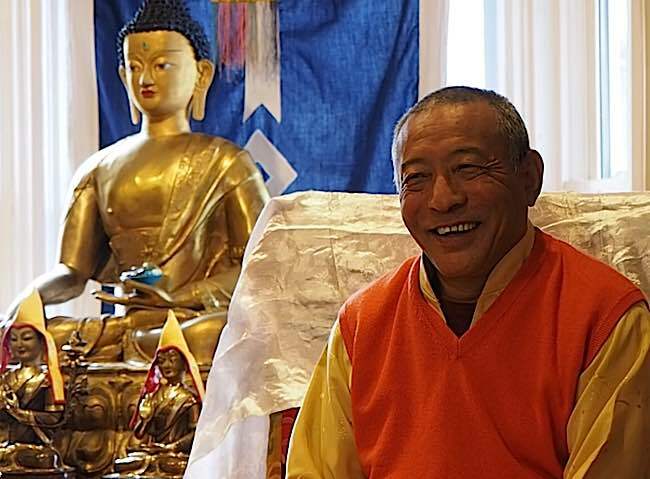 Zasep Tulku Rinpoche, and most Tibetan Gelugpa teachers — teach this very powerful, yet accessible practice. The practice does not require initiation or empowerment—although the guidance of a teacher and initiation are beneficial. 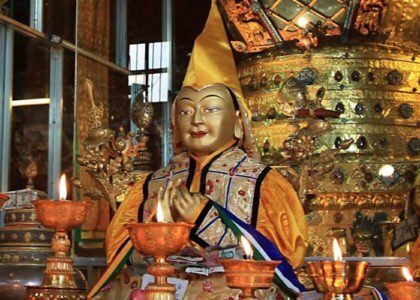 Lama Tsongkhapa is a “Buddha of our times” in the Gelug Vajrayana tradition. As an enlightened being, Buddha Tsongkhapa has the same realizations as all of the Conquerors (Buddhas). His practice is very powerful, in part, because he was an emanation of Avalokitesvara (compassion), Manjushri (wisdom), and Vajrapani (power). 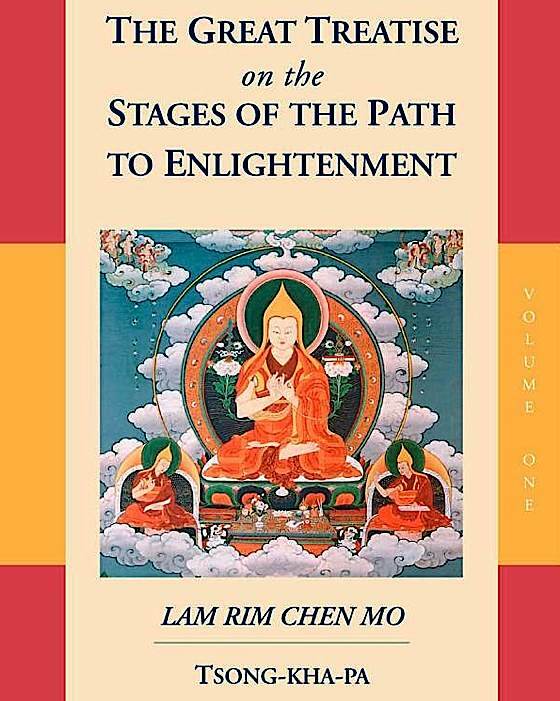 Famously, Lama Tsongkhapa wrote the three volume Lam Rim Chenmo text: The Great Treatise on the Stages of the Path to Enlightenment (see below), books on Lamrim that numerous serious practitioners read, reread and refer to throughout their lives. Beautiful Tangkha of Lama Tsongkhapa, the founder of the Gelug school of Tibetan Buddhism, who is considered to be an Enlightened Buddha. Lama Tsongkhapa in centre, his two “spiritual sons” (disciples) close by his knees, Shakyamuni Buddha top centre. He is visualized as a wise and kind guru, smiling and beautiful, with a tall yellow pandit’s hat, seated on a lotus throne, with all the marks and signs of a Buddha. His kind, smiling visage makes him approachable to many new to His practice, while his authority as a great Sage makes him reliable and beneficial. Tsongkhapa (Je Tsong-kha-pa Blo-bzang grags-pa) (1357-1419) is considered, by millions, to be a great sage. Shakyamuni, the historical Buddha, is the great Sage of our times, the Enlightened Buddha. Padmasambhava (Guru Rinpoche), another enlightened sage, foretold Tsongkhapa’s coming. 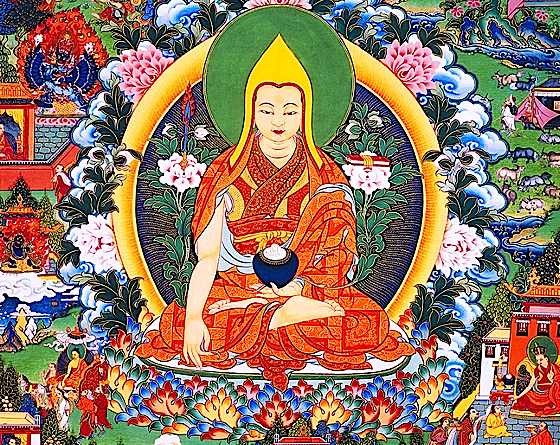 Tsongkhapa famously wrote numerous authoritative texts, and notably the Lamrin Chenmo. His teachings rejuvenated Buddhism at a time when it fell into degenerate beliefs, and fused Sutra practices with Tantra. Tsongkhapa’s teachings instilled such belief and practice in Tibetan Buddhists that it had a profound impact on the history of Asia. Practices Tsongkhapa taught found their way into China, Japan, Korea, India and ultimately around the world. HH the Dalai Lama iln front of a sacred tangkha depicting Lama Tsongkhapa. Lama Tsongkhapa founded the Gelug Tibetan school of Buddhism, to which His Holiness belongs. Daily Lama Tsongkhapa’s Guru Yoga makes it easier for us to develop compassion, and let go of anger. It is a short practice, ideal for busy people with little time to meditate. Many Gelugpa teachers advocate Lamrim and foundation practices, including Lama Tsongkhapa and Vajrasattva practice. For example, the students of teacher Venerable Zasep Tulku Rinpoche, are taught in the “Guidelines for Students” to study sutra, tantra, Mamhamudra, Lam Rim Chen Mo, and deity yoga: “This is the order… Lama Tsongkhapa including Manjushri, Chenrezig, Vajrapani” followed by other Kirya Tantra deity practices. Zasep Tulku Rinpoche teaching at Gaden Choling. To his right are Buddha Shakyamuni and in front, Lama Tsongkhapa. Rinpoche emphasizes the importance of Lama Tsongkahapa, Lamrim and foundation practices (Ngondro). The Migstema Tsongkhapa mantra chanted by Chanted by Lama Ngawang Thogmey. Recorded in san Antonio, Texas. 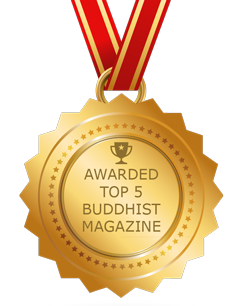 The short Guru Yoga of Lama Tsongkhapa, on one level, contains all the 84,000 teachings of Lord Buddha. As the practice is short, it is easy to memorize, and quick to practice — ten minutes from beginning to end if you don’t pause to meditate or to chant extra mantras. Lama Tsongkhapa butter lamp offerings. For body, we might fold our hands in prayer, bow, or make a symbolic mudra (hand gesture) for offerings. For mind, especially in Tibetan tradition, we visualize or imagine the Buddha in our minds, and also try to keep that visualization and the practice in context with the concept of wisdom — in this case, our own understanding of emptiness, dependent arising and so on. 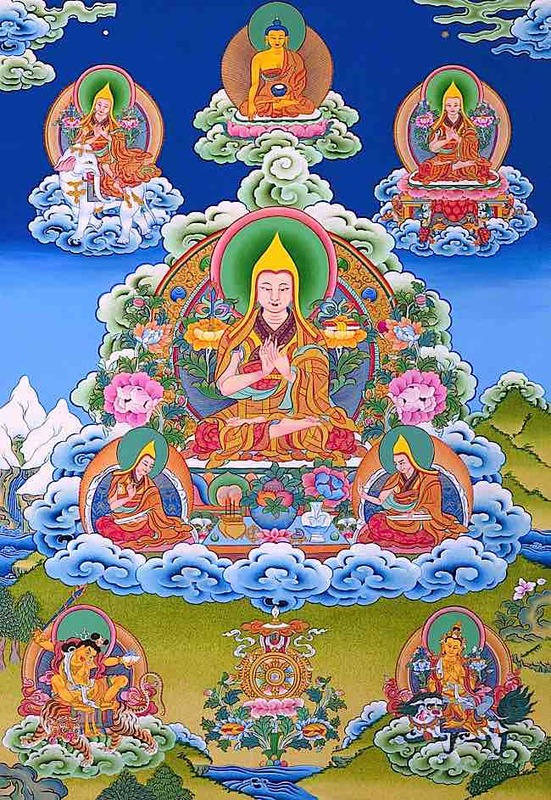 Visualization: imagining or picturing the “merit field” which means picturing the Enlightened Buddha (in this case Lama Tsongkhapa) and his disciples or attendants. Seven Limbed Prayer: prostrations, offerings, declarations, rejoicing, requesting teachings, requesting Lama Tsongkahapa remain with us always, and a dedication. Mantra: spoken and visualized: often visualizing healing light from Lama Tsonkhapa going out to all sentient beings and easing their suffering. 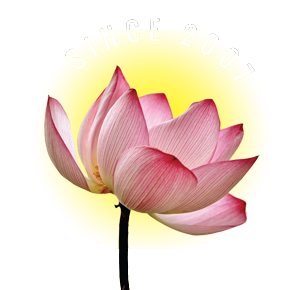 Final Dedication: all Tibetan practices always dedicated the merit of the virtue of the practice to the cause for Enlightenment for the benefit of all sentient beings. Beautiful Tangkha of Lam Tsongkhapa, the founder of the Gelug school of Tibetan Buddhism, who is considered to be an Enlightened Buddha. May I attain Enlightenment in order to benefit all sentient beings. May all beings dwell in equal love for those both close and distant. Please come to this place together with your two chief disciples. The Venerable Gurus smile with delight. Please remain for a hundred aeons to spread the teaching. Your beautiful bodies are ablaze with the glory of renown. I offer to you, Supreme Field of Merit. With great remorse I declare each one from the depths of my heart. In this degenerate age you strove for much learning and accomplishment. Abandoning the eight worldly concerns, you made your leisure and endowment meaningful. I rejoice in the great wave of your deeds. Appropriate to the disciples of this world. 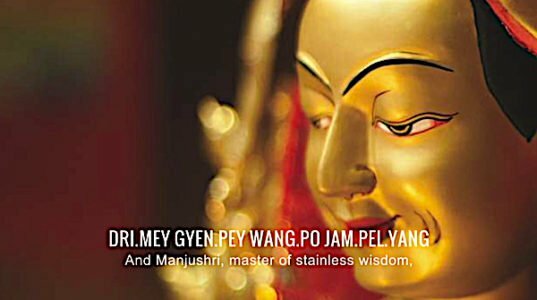 Of Lama Je Tsong Khapa shine forever. Adorned with Mount Meru, the four lands, the sun and full moon. May all living beings experience pure happiness and be reborn in pure lands. I send forth this jewelled mandala to you, precious gurus. And in your great kindness, please remain with me. Please bestow upon me the blessings of your body, speech and mind. 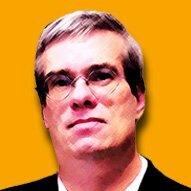 Please grant me the common and supreme realizations. Please remain until I achieve the essence of Enlightenment. without exception, into that state. Which has not yet been generated now be generated. Never decline, but always increase. 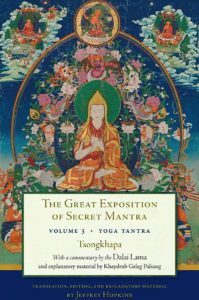 Tsongkhapa’s writings, particularly his The Great Treatise On The Stages Of The Path To Enlightenment, helped re-invigorate the practices of Vajrayana Buddhism, and has been read and studied by countless students. Now, translated into English, in three volumes, The Great Treatise On The Stages Of The Path To Enlightenment is accessible to English-speaking peoples for the first time. 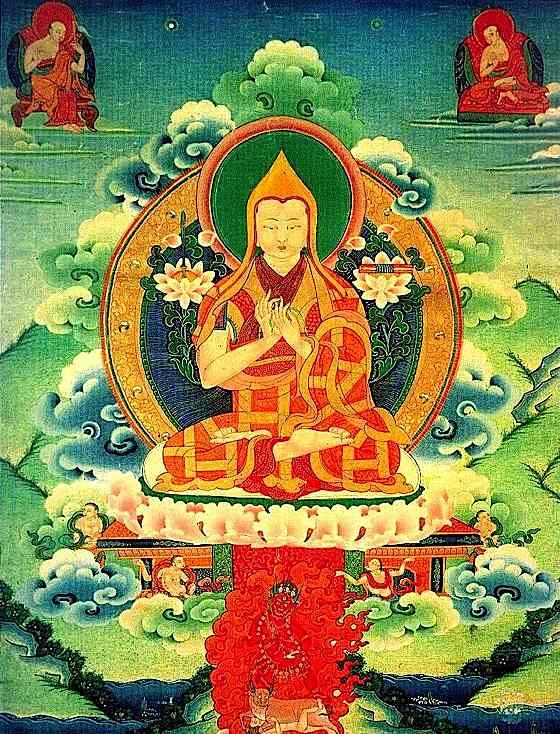 “Of the many works of the Tibetan master Tsongkhapa, none compare in terms of popularity and breadth of influence with his Great Treatise on the Stages of the Path to Enlightenment (Lamrim Chenmo), which has been treasured by practitioners and scholars alike for centuries,” wrote His Holiness the IVth Dalai Lama. The Great Treatise On The Stages Of The Path To Enlightenment is an English translation, eagerly awaited by English-speaking devotees. The translation took years and was undertaken by the Lamrim Chenmo Translation Committee to their great merit. 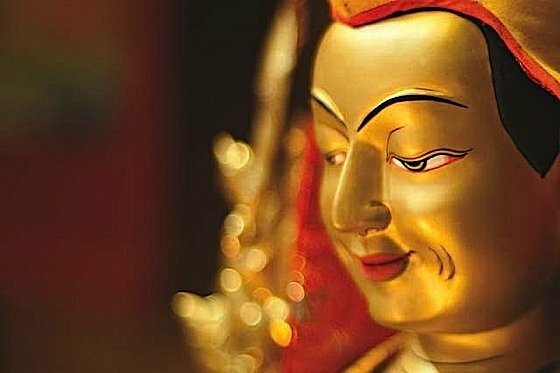 Once when Gyalwa Mikyo Dorje was travelling through the Charida Pass, thoughts of the incomparable Tsongkhapa welled up within him. Overcome by profound faith, he was moved to compose the above poem. Without illusion, O Tsongkhapa, you polished the teachings. O Tsongkhapa, who watches with compassionate eyes. O Tsongkhapa, have their every wish fulfilled. May this be most beneficial for all sentient beings, bringing kind mother sentient beings — whose lives are lost, under the control of karma and delusion, totally enveloped in the darkness of ignorance — to the achievement of enlightenment as quickly as possible. May anyone who merely sees this text, reads this text, teaches this text, hears about this text, or keeps this text thereby actualize indestructible guru devotion, seeing the Guru as Buddha, and train well in the three common principles of the path, actualize the two stages, and achieve the unified state of Vajradhara as soon as possible. May he or she especially generate loving kindness, the compassionate thought, and bodhicitta and immediately become a source of peace and happiness for all sentient beings, especially in this world, and may all war, famine, disease, sickness, epidemics, torture, poverty, and the dangers of fire, water, wind, and earthquakes immediately cease so that no one will experience any of these undesirable circumstances ever again. May the pure teachings of Lama Tsongkhapa flourish continuously and spread in all directions. Great Treatise on the Stages of the Path to Enlightenment (Lamrim Chenmo) truly is the path to enlightenment.